Litecoin’s New Minimum Transaction and Relay Fees Per Kilobyte (kB). Now let’s talk about what each of these two fees mean. The default setting for a minimum transaction fee for Litecoin core is currently 0.001 LTC. 0.001 LTC x size of the data of the transaction to be recorded in the blockchain. If a standard Litecoin transaction is around 200 bytes (where you received LTC from 1 address and sent LTC to 1 address), then you should set your minimum fee to 0.0002 LTC. You can do this by clicking the “send” tab in Litecoin Core then “choose” on the bottom left next to “transaction fee.” Click “Custom” and “Pay only the required fee 0.001 LTC/kB.” You can also do this with many other Litecoin wallets as well. It’s important to note that the data size of your transaction isn’t dependent on the number of Litecoins you send. Rather, it’s dependent on how many transactions you received in your LTC address and how many transactions you are sending. Note that the size of the transaction is 191 bytes. 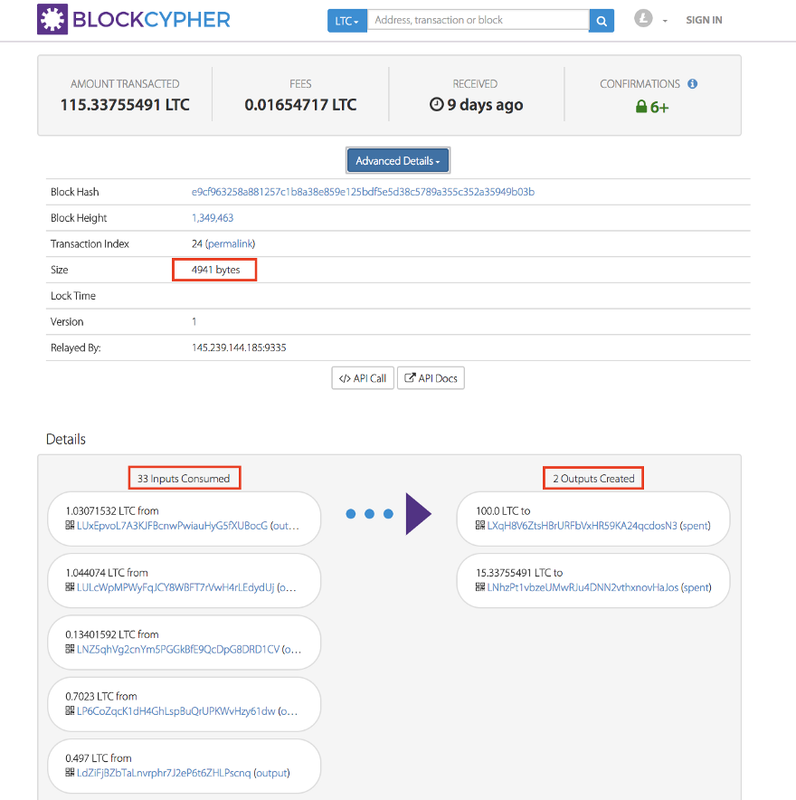 This is taken from live.blockcypher.com/ltc. The reason why a transaction like this takes up more space in the block is because you need to provide 33 signatures to cash out of each of the inputs you received and 2 signatures to send to the 2 Litecoin addresses (1 of which is a change address). This means that multisig transactions will also require a higher minimum transaction fee because of the amount of blockspace it takes up. It is important to note that miners will most likely select high fee/kB transactions in order to maximize their profits. Keep this in mind as you custom set your fees. Lower transactions may take longer to send. This is why some people custom set their fees to be higher than the default minimum transaction fee/kB. The default minimum relay fee is also currently at 0.001 LTC. Now remember when we were talking about the default minimum transaction fee? Well both the minimum transaction fee and minimum relay fee are actually “suggestions” and can be bypassed by individual nodes. This is important because when you send your transaction, it is stored in something called a “memory pool” in full nodes while it waits to be processed by a miner. If your transaction is below the minimum relay fee, it will be dropped out of the memory pool and therefore won’t get processed. Because the minimum transaction and relay fees were the same, understanding the difference wasn’t as big of a deal. But now that the relay fee is 10x’s less than the transaction fee, let’s see how this might affect users and miners. If you send the new default minimum transaction fee of 0.0001 LTC/kB, then you can rest assured it will pass through the network without an issue if there isn’t a backlog in the memory pool. But as we discussed earlier, the minimum transaction fee can be bypassed. But how low exactly can a user set the transaction fee? 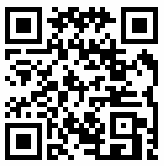 This is limited by the default minimum relay fee of 0.00001 LTC. If we assume that most nodes simply download the Litecoin Core wallet and don’t adjust their minimum relay fees to be lower, it’s a pretty safe bet that this is the lowest fee you can set for your transaction to be relayed across the network. Determine the data size of your transaction. If not, then decide if you want to send the minimum relay fee (or slightly above) to keep more of your LTC. If you feel particularly adventurous, try sending a transaction below the default minimum relay fee and see if it gets picked up by random nodes that will process the transaction because they custom set their minimum relay fees below the new default of 0.00001 LTC.